When you think of American cabernet sauvignon, does Napa Valley come to mind? These 8 Red Mountain wineries in the state of Washington may beg to differ. 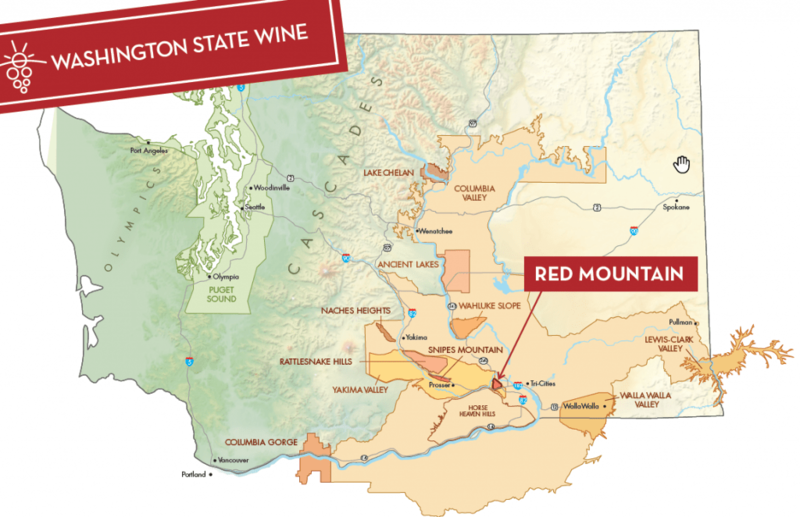 Located in the Tri-Cities area of Washington, and a 3.5 hour drive from Seattle, Red Mountain is a wine growing region of just over 4,000 acres. 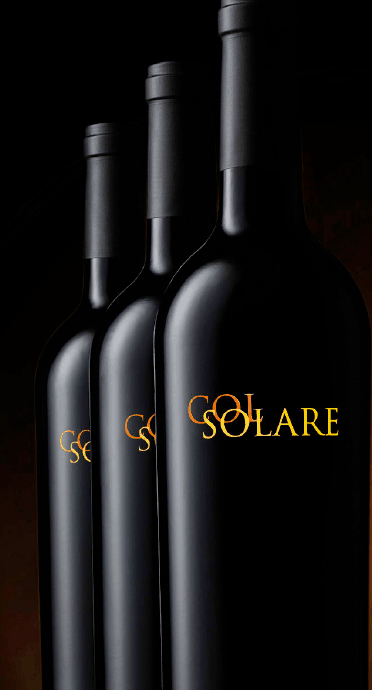 Its southwestern slope provides long sunlight exposure that makes the grapes ripe and concentrated. Long sunny days that average 90 degrees F are contrasted with cool nights below 50 degrees F. The soil is a result of pre-historic floods that deposited high-mineral, high-carbonate glacial eroded sands, gravels, cobbles, and boulders. In addition, regular gusts of wind keep the grapes small and concentrated. It is more like a sloping hillside. 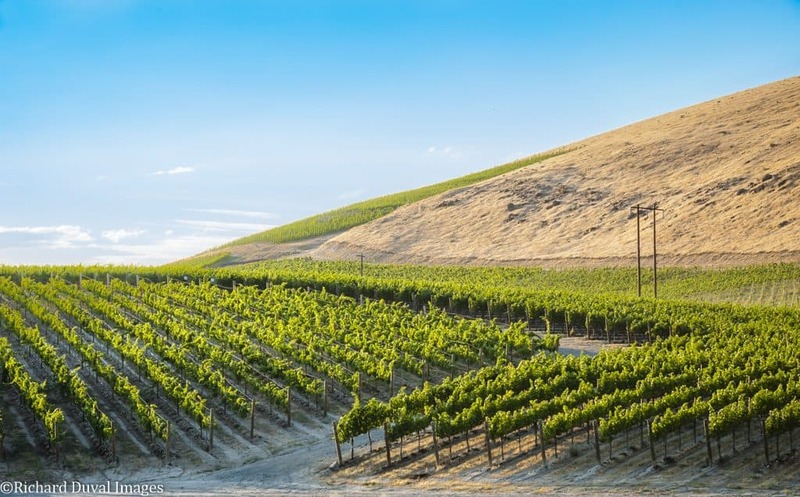 It is a sub-appellation of the Yakima Valley American Viticultural Area (AVA). During the spring, it looks red due to the color of cheatgrass. The southwestern facing slope means long sunlight exposure ideal for ripe tannins that result in ideal Red Mountain grapes. 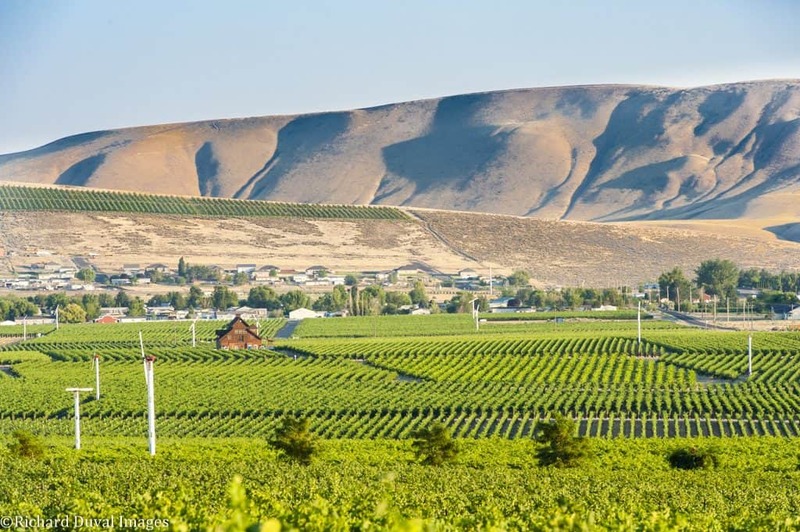 Red Mountain has more hot days of any wine growing region in Washington, resulting in ripe and concentrated fruit. During the growing season, it gets two hours more sunshine per day than Napa Valley. Red Mountain soil is highly alkaline and rich with calcium carbonate. This allows the roots to establish themselves and reach deep for extra moisture and nutrients. Sandy loam and gravel with a high PH and rich calcium carbonate content allow the vines to go deep. With only 5-6 inches per year, Red Mountain wineries use drip irrigation and canopy management to keep their vines hydrated. During the growing season, there is almost no precipitation at all. Regular gusts of warm air on Red Mountain keep the grape clusters small and concentrated. 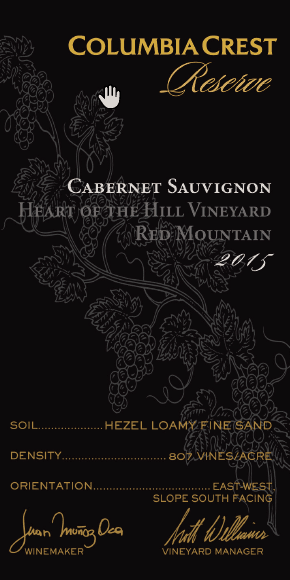 Cabernet sauvignon (Cab) is king on Red Mountain. It is a late ripening grape varietal that needs heat, otherwise, it will become herbaceous and taste like green bell pepper instead of juicy red fruit. Other grape varietals grown include merlot, cabernet franc, syrah, sangiovese, malbet, petit verdot, and other Rhone varieties. 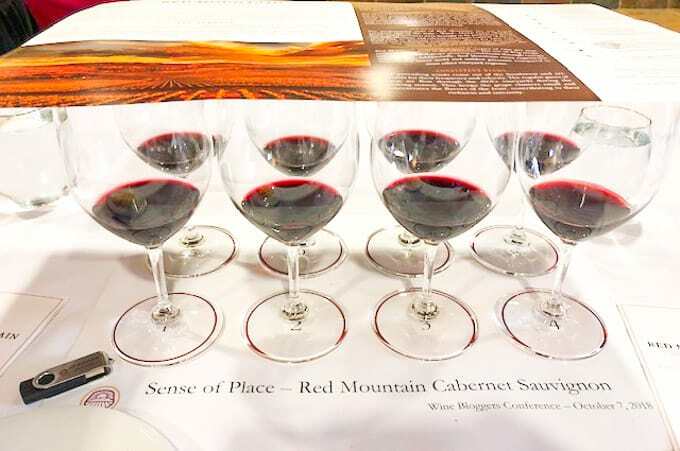 At a tasting hosted by the Red Mountain AVA Alliance, 8 cabs from this iconic mountain showcased how different one grape and one AVA could be expressed via various winemaking techniques and vintages. Wine vintages range from 2011, 2014, and 2015. 2011 was one of the coldest years for Washington while 2015 was one of the warmest, and you can taste the difference in the wines below. Taste: Blackberry, wood, dust, chalk on the back end. Lingering finish of cocoa, black fruit, and anise. This wine is a partnership between two influential wine producers, Tuscany’s Marchesi Antinori and Washington State’s Chateau Ste Michelle. 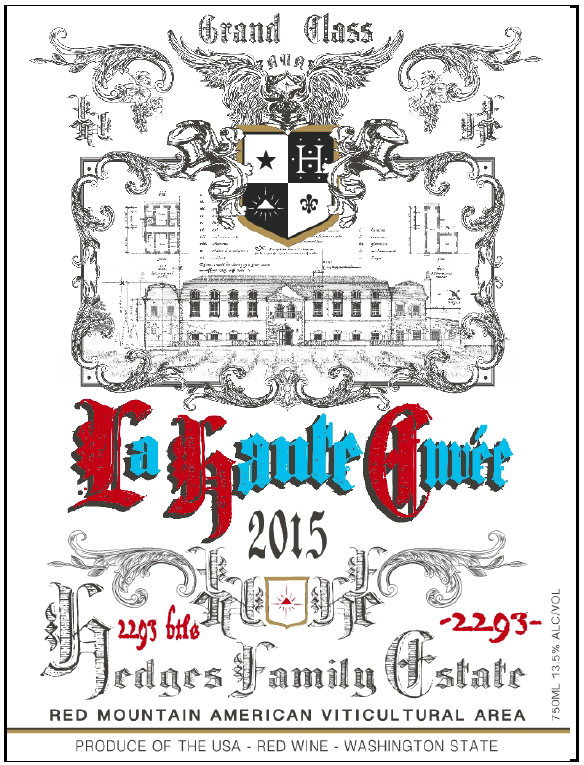 It is aged in French oak barrels for 21 months. Aroma: Herby, foresty, and dusty. Taste: Dried sage, lots of tannin, and chalk. This is a big, juicy cab. The fruit has been handpicked, destemmed, and sorted into stainless steel tanks. The grapes are cold soaked for two days prior to fermentation in order to extract flavor without too much tannin. Half of the wine is aged in French Oak tanks for 6 months then added to neutral oak barrels where it is aged for an additional 10 months. Aroma: Cooked fruit, fruit cobbler, figs, raspberry, blueberry, dark cherry, and vanilla bean. Taste: Big fruit, chalk, and tannins. Blackberry, sweet cigar, and baking spice with a long finish. Some say this cab is flabby with not enough acid. The fruit falls off a bit, while the tannins linger. Perhaps it just needs a juicy, red steak or earthy cheese to perk it back up. Aroma: Rose, violet, coffee, smoke, eucalyptus, spearmint, and toothpaste. Taste: Leather, tannin, and heavy barrel influence. This is a biodynamically farmed wine that is destemmed and partially crushed into stainless steel tanks where it begins fermenting with native yeast. 100% barrel aged for 18 months in 40% New American oak barrels. Aroma: Candy, licorice, black olive, brine, and sweet pickle. Taste: Soft tannin, dust, and chalk. This Cabernet is the most balanced of the bunch and a nice all over mouthfeel. Aroma: Cough syrup, nail polish remover, pine resin, and a strong chemical influence. Taste: This tastes like it needs heavy pork ribs with BBQ sauce. Definitely, a wine to enjoy with food. Aged 32 months in French oak barrels. 2011 broke the all time record for a cool vintage in Washington. Cool temperatures dominated through July. Warm weather finally came in August and lasted into October. The grapes developed acid but with lower sugar levels. Due to the late cold spring and late frost, the grapes never really got any fruit. This is a quintessential example of how much weather affects the sugar levels and quality of the wine. Aroma: Blueberry and smoked cured meat. Taste: Like a rush of fruit with gentle structure. 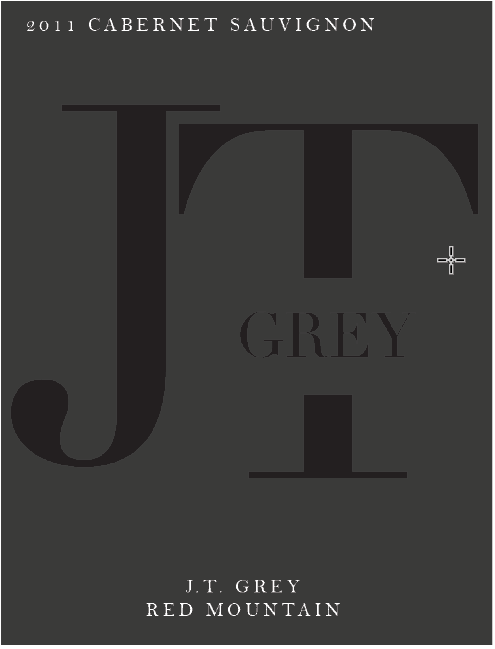 This is silky, velvety, and has rose petal notes with a soft finish. From old vines that are 40 years old, this wine is smooth, elegant, and will easily melt in anyone’s mouth. Taste: Spicy finish with clove and nutmeg. This wine is delicate, light, and lean. Planted high on Red Mountain, these grapes get full exposure to all the elements. The result is a fruit forward Cabernet with structured tannins, the textbook characteristics wine from Red Mountain. Though all of these wines come from cabernet sauvignon grapes that descended from the same hillside slope, they are each quite different. Like siblings descended from the same parent, they are related yet each their own. 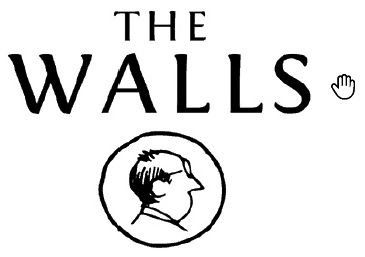 This is 2 of 3 posts written in exchange for a discounted ticket to the Wine Media Conference held in Walla Walla, WA in September 2018. Do you love cabernet sauvignon? Please spread the Asian ♥ and share!